Unless we’re talking London After Midnight, most “lost” Hollywood movies eventually get found. And if they happen to attain a mythical status during their absence from visibility, then their re-discovery has major gravitas and becomes an event in and of itself. 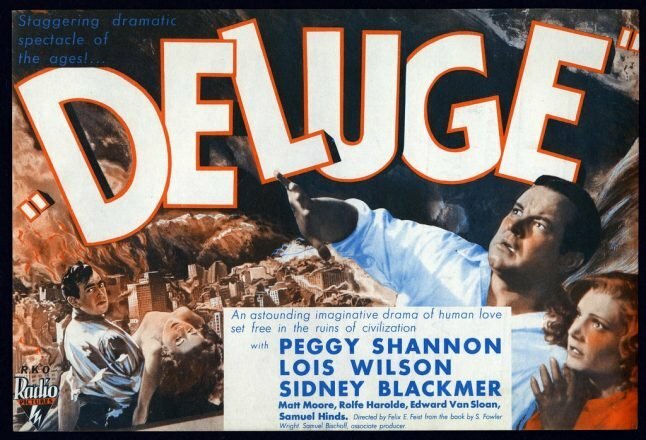 Such is the case with 1933’s Felix E. Feist (Donovan’s Brain) directed Deluge, a harrowing and groundbreaking apocalyptic horror/drama that, after a successful run in its initial release, literally vanished from the face of the earth. In what is one of the greatest cult film WTF turn of events, Forest J. Ackerman — yes, the original “Monster Kid” and the founder of Famous Monsters of Filmland Magazine — and producer Wade Williams found an Italian-dubbed print of the movie in the moldering basement of Contamination and Starcrash director Luigi Cozzi’s in Rome. That was back in 1981 and it was a big deal, not just in cult film circles but in all film circles, and when an English negative was found in 2016, Lobster Films gave it a 2K restoration and the result is this Blu-ray, yet another sterling release from Kino Lorber. Deluge’s current easily screened status would be a big deal even if the movie itself was dross, but luckily it’s far from it. In fact this end of days melodrama is rough stuff and, like many per-production code Hollywood films, it pushes boundaries both sexual and visceral. In it, the storm of the century rages through New York and then the world, with a sudden solar eclipse and an unyielding succession of earthquakes leading to the end of days. As panic crushes the planet, we follow a kindly family man named Martin (Sidney Blackmer from Rosemary’s Baby) and his wife Helen (Lois Wilson) trying in vain to salvage their belongings and flee with their sweet young children to safer, higher ground to avoid the surge of floods. When Martin returns to the area where he left his family, they are gone. Presuming they have been drowned, the shattered man builds a shelter and tries to survive alone. At the same time a woman named Claire (Peggy Shannon) escapes the clutches of two increasingly savage men who saved her, swimming across the body of water that has submerged New York and being found by the lonely Martin. The two develop a romance and essentially become husband and wife. When the pair end up — after much post-apocalyptic battling with uncouth survivors — in a make-shift town where survivors are attempting to rebuild society, Martin discovers that his wife and children are very much alive and that Helen is now shacked up with another man. What follows is a wrenching love triangle as Martin must now decide between the two women he loves. Deluge‘s main draw is its scenes of wanton destruction and indeed, this was the first in a very long line of movies in which New York gets punished hard. The same year we saw King Kong climb it, the Empire State Building is reduced to rubble as is the entire city, with buildings obliterated and citizens getting crushed by steel beams and bashed by falling bricks. Oceans rise and tsunamis drown screaming people and submerge society. It’s all done with totally believable miniatures and matte paintings and shot with urgency by Norbert Brodine. Curiously, the love story at the core of the film anticipates what would happen in another post-apocalyptic thriller, TV’s The Walking Dead, when, in Season One, Rick Grimes — thought dead — finds his wife Laurie and son Carl alive and well and now living with another man, with a similar drama unfolding amidst a backdrop of destruction and depravity. But Deluge is even more emotionally affecting and when Martin’s disbelieving babies first run to him and he grips them in his arms, you genuinely feel the man’s pain and exhilaration. 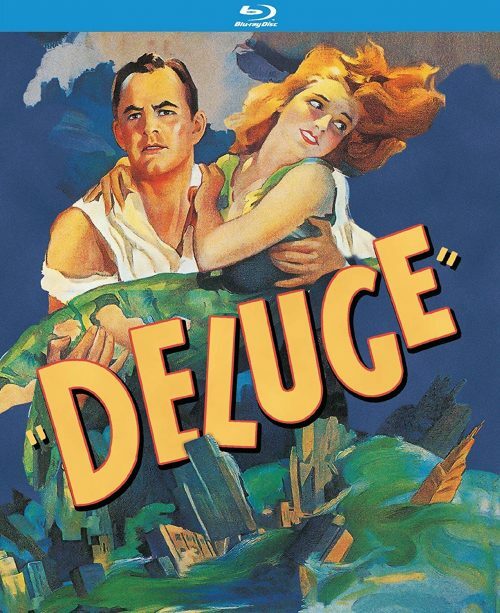 Deluge is most assuredly a classic film and it’s remarkable to have it back in easy circulation so that both scholars and newly-minted cinephiles can discover it. As an added bonus, Kino Lorber has popped another scrappy little early Hollywood melodrama on the back end with Back Page, an amusing sorta-thriller starring Deluge‘s Peggy Shannon as the new editor of a fledgling newspaper who bravely battles corruption. It’s a great addition and a classy touch. Pick up Deluge on Blu-ray here.